We are engaged in offering Kashmiri Silk Carpet. 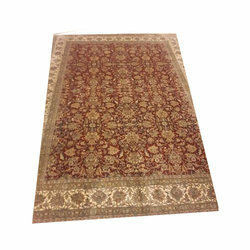 - Description : Luxurious and elegant Mughal court carpets add a touch of royal splendor to the decor of abodes. These carpets are handwoven by skillful Kashmiri weavers. Kashmiri Carpets manufactured and supplied by us are hand made artistic carpets. These Kashmiri carpets are renowned all throughout the world and are in huge demand for the fact that they are not tufted, but hand made. Our team of creative craftsman are able to weave superior quality carpets with exquisite designs and prints. Cashmere carpet is a popular handicraft product of Kashmir, India.The main feature of cashmere carpets is the fact that these cashmere carpet is made by hand from start to finish and these hand woven Cashmere carpet is far superior to the machine made carpet in terms of fineness, intricacies and the designs involved. 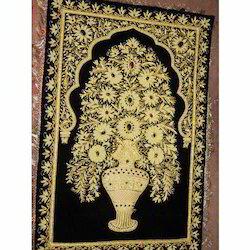 cashmere carpet is a popular handicraft product of kashmir, india. The main feature of cashmere carpets is the fact that these cashmere carpet is made by hand from start to finish and these hand woven cashmere carpet is far superior to the machine made carpet in terms of fineness, intricacies and the designs involved. Prezlaan is reviving Kashmiri arts to its previous glory. With proper Brand Creation, Use of IT tools, setting up of Quality Control and Getting Quality Certifications Prezlaan will present the Kashmiri Arts to the world in its true sense.